Presentation On Sale Today... Check Out The Deal! Listing Presentation Idea #1: Make Your Presentation Educational! Your Clients Hate To Be 'Sold'. Consumers want to be informed so they can make an informed decision. This is an absolute truth when it comes to your listing presentation. The last thing you want is to sound like a salesperson. Instead you want your listing presentation to be educational. You want to inform your client on every step of the home selling process. As you take your client through the steps, their reluctance to list gradually reduces. A fully informed homeowner is more than able to make the decision to list. How the MLS really works. How you use the MLS to create a list of targeted buyers. How the condition of the home impacts price and showings. What dual agency really means. What happens at the closing table. Listing Presentation Idea #2: Make Your Presentation Fun! Your Clients Love To Be Entertained. You must keep your client interested in what your real estate listing presentation is offering. For this reason make sure you have more than just a few loose pages of information on the table. Rather you want your listing presentation to be professionally designed to not only impress your client but also keep your client interested in your marketing plan. Make sure your presentation is concise, cutting-edge and well-branded. It must have professional images matching what you are attempting to convey to your client. And a font size of at least 24. You definitely want your client to be able to read the listing presentation without eye strain. You ought to consider adding video to your presentation. It's easy to do and adds entertainment value. MLS Buyers on the kitchen table. Exposure strategies to these MLS buyers. Internet strategies to uncover buyer leads. Listing Presentation Idea #3: Make Your Presentation Exciting! Your Clients Want Only The Best. You certainly may want to use a marketing agency to create stunning marketing material you can show off to your client when on the listing appointment. And don't forget about the Internet. You absolutely must have powerful buyer websites that prove to the seller you know how to capture buyer leads online. Your marketing must convince your client that your ideas resonate with buyers and motivate buyers to take action. That's why you must have compelling photography and well-articulated marketing pieces and a highly professional looking listing presentation. Show them your proven marketing plan for buyer acquisition. Go as far as putting a list of real buyers on the kitchen table. Simply said... you want your client to be excited. Listing Presentation Idea #4: Make Yourself Look Like A Seasoned Professional! Impress Your Client With Action. No homeowner wants to list with an agent who is going to hide. And they certainly do not want to list with an agent who doesn't want to roll up their sleeves. That's why you want your listing presentation to (Wow!) them with action. Show them exactly what you are going to do... each and every day. Back it up with testimonies from happy clients who brag about how great of an agent you are. Don't be shy. Prove without a shadow of a doubt that you are the right agent for the job. Specific actions you take during the first 7 days. How you inform other MLS agents so they know the home is for sale. Why you send out Just Listed postcards to the homes closest to the new listing. Why you book an agent open house. The marketing you to to your current database of buyers. How you inform agents in your office of the new listing. Your intimal Internet Marketing and Facebook marketing plan. 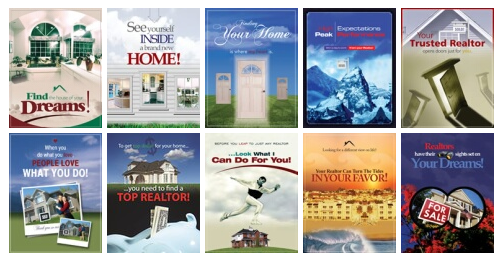 Listing Presentation Idea #5: Make It Thrilling! Today's homeowner places massive weight on the importance of the Internet when it comes to finding a buyer. This provides you with the opportunity to showcase your Internet tech-savviness in your agent listing presentation. Now is the time to dazzle your client with stunning examples of what you do online. Take no hostages. Go overboard and knock the socks off your homeowner. Show them everything. Leave nothing out! In doing so you will guarantee your client is impressed with you. Listing website just for your homeowner's home. Remember to send your client an email as soon as you have arrived back to your office or home. In that email thank your client for having invited you over to the home. If they have signed the listing, make sure to include the initial steps you are taking as you place the listing on the MLS board. Set the tone for your arrival by sending your pre-listing presentation package at least 2 to 3 days in advance of the listing appointment. Including the following 3 strategies inside your pre-listing packet. A letter from your Broker introducing the company to your client. 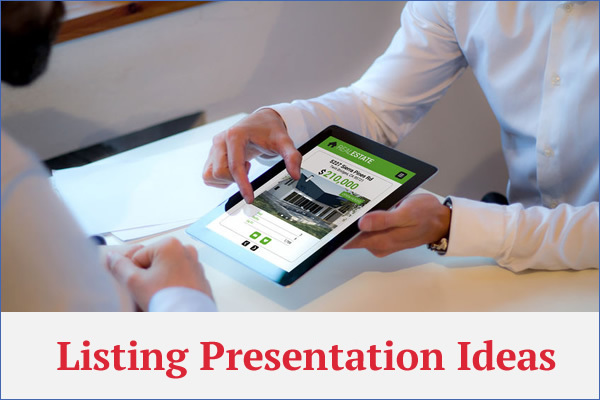 If you enjoyed this 'listing presentation ideas' article you may also like how to create a listing presentation or listing presentation scripts for agents. 5 Listing Presentation Ideas For A Winning Listing Presentation.